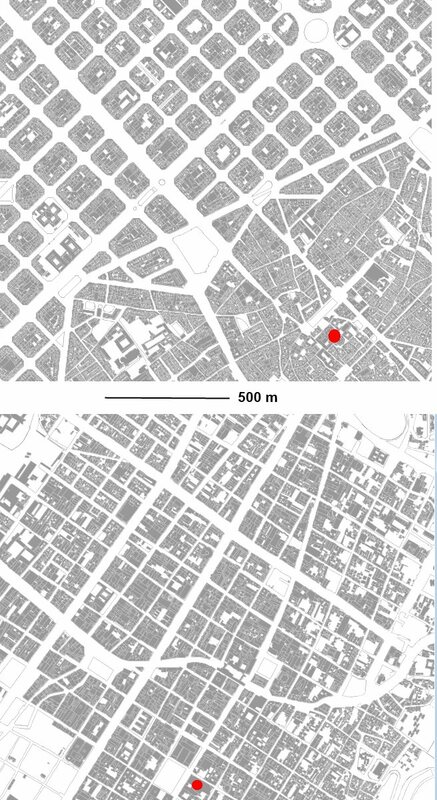 The old core of Barcelona results from the evolution of the primitive roman colony, even if it is difficult to believe by looking at the urban fabric (the large straight streets come from the Cerdá plan in the XIXth century). 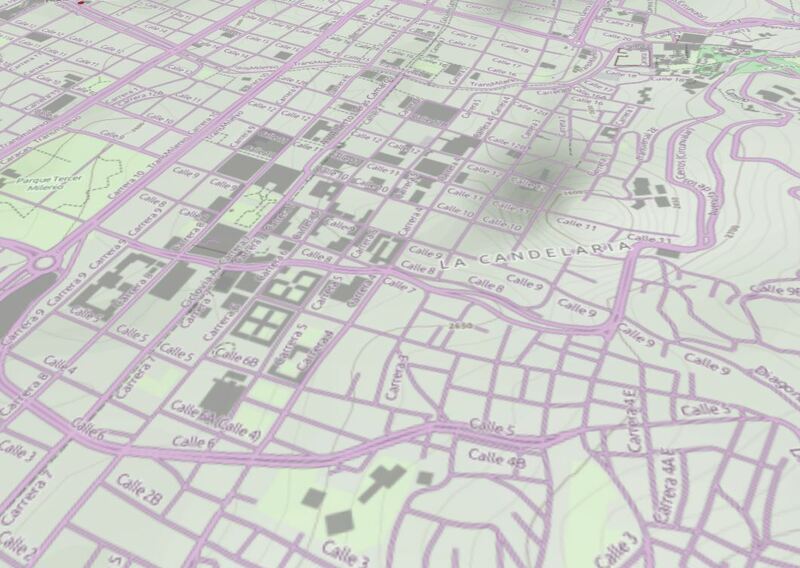 In Bogota the traces of the Laws of the Indies, with their grid, is clearer. In Barcelona the Cathedral (red) and the City Hall (blue) are on different squares, while in Bogotá a single space is shared, with a clear symbolism as it also concentrates the headquarters of the judiciary and the Parliament. Urban growth shows that the aim to regularity always finds unexpected conditions… a regular fabric is almost impossible. Floor area (sq m) for residential use in Barcelona and Bogotá, by city block. NO means there are no registered housing surfaces on the block. City Halls are marked by a black circle. Where do people live? And where do they buy? Answering those questions in a precise way is complex. 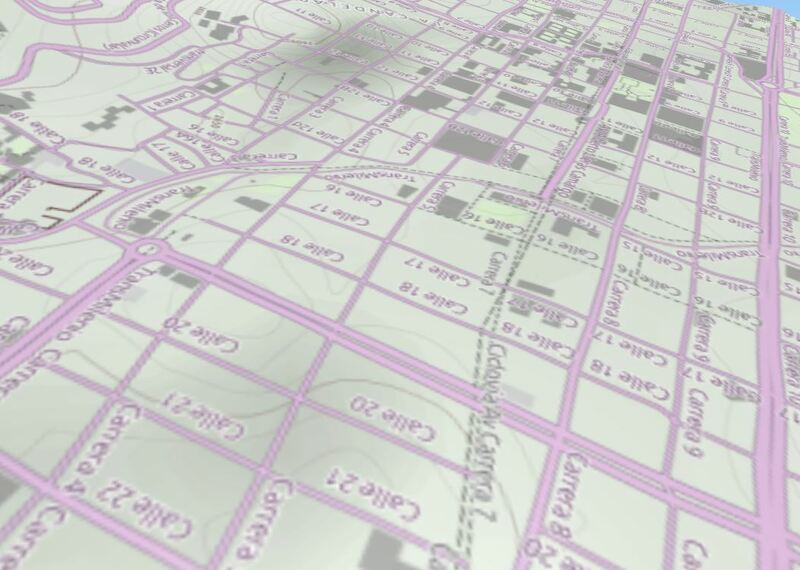 But it is simpler to know where they could be doing one thing or the other, again using cadastral data on maps at the same scale of both cities. This implies that you will not be sure to find people living in these areas or open retail venues, but that someone is (or should be) paying the tax for these uses in these properties. 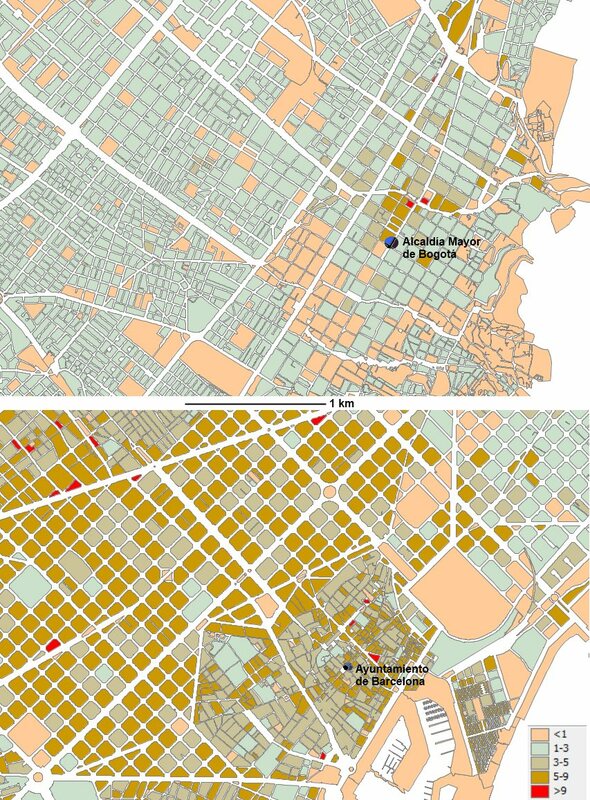 These maps are not representing densities, but absolute figures by city block; it is as important to know where the surfaces of these uses are and their magnitude, as knowing where there is no such use. The firs conclusion is that the intensity of the residential use on central Barcelona is higher than in Bogotá (even taking into account that the city blocks are usually smaller). 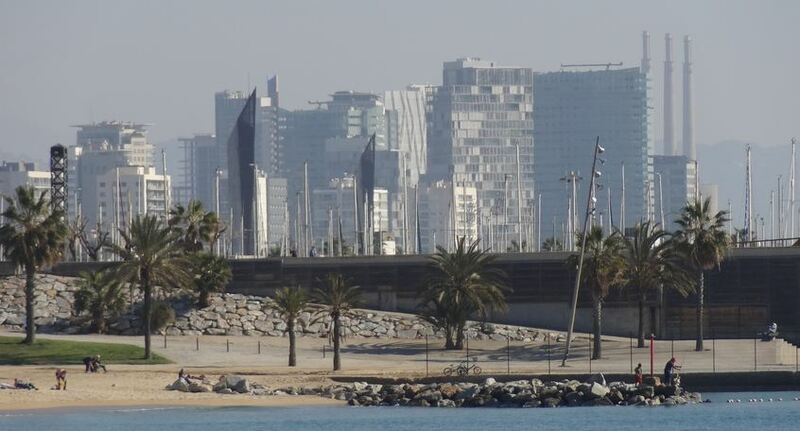 And it could be a surprise to some, as on many images of the second city you can see some towers, while the image of Barcelona is that of a city of uniform heights. In fact, Bogotá has a larger population, but on a much wider area. What happens is that the average height in Bogotá is less than in Barcelona, and less deep buildings. In Barcelona, 150 years after Cerdá presented his plan to reduce congestion in the city center, and despite having somehow achieved that goal, the new city is still very dense. 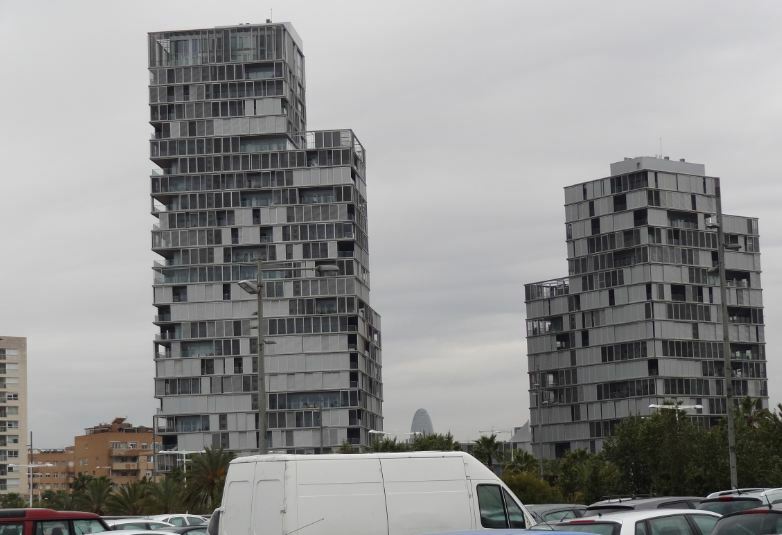 Taking a different viewpoint, 2012 Barcelona had 1,6 millions residents (padron, ine.es) and slightly over 72 million sq m of built residential floor (cadastre); so each barcelonés had on average 45 sq m of housing. Bogotá Distrito Capital had in 2012 slightly over 8,9 million residents (estimates by dane.gov.co) and a little more than 179 million sq m2 of residential floor (cadastre); each bogotano had on average 20 sq m of housing floor, less than half, which explains the differences in residential density. Regarding commerce (as applied by both cadastres, with differences that are not always clear between wholesale and retail), there is a difference and a similitude. The historical core of Barcelona is larger in terms of retail density (concentrating the most affluent populations in the XIXth century grid no doubt helps…), while in Bogotá the area north of plaza Bolivar which concentrates these uses is smaller. 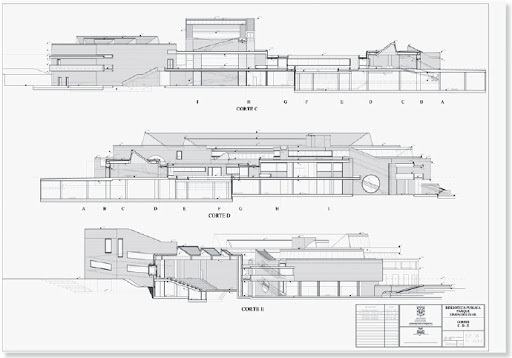 The similitude is in the development of the large malls. Despite their sometimes relevant links to public transit systems, they are also car attractors. 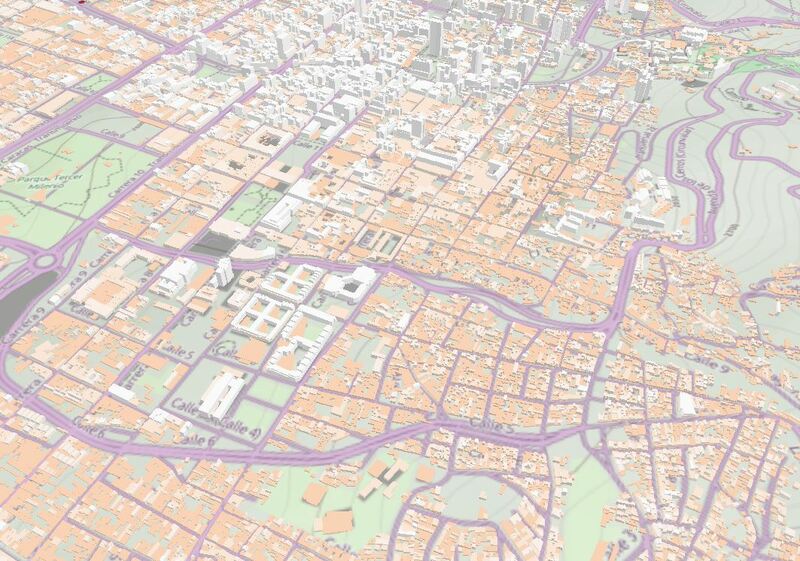 According to cadastral data, in Bogotá there are 0,07 sq m of commerce floor for each sq m of residential floor; in Barcelona this rises to 0,188. 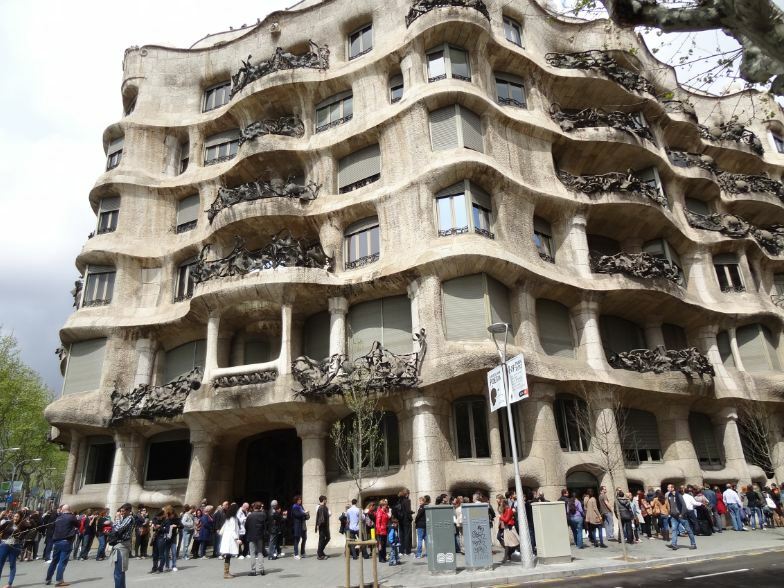 For each bogotano you have about 1,4 sq m of commerce, and for a barcelonés slightly over 5. 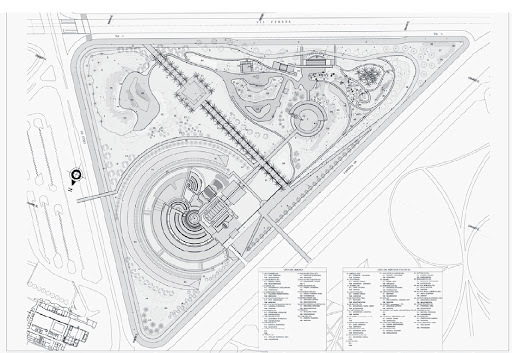 With a FAR below 2 (the average in the area, altought with different building types), the Agora center will be a conventions facility by carrera 40 and the Corporación de Ferias in south Bogota. 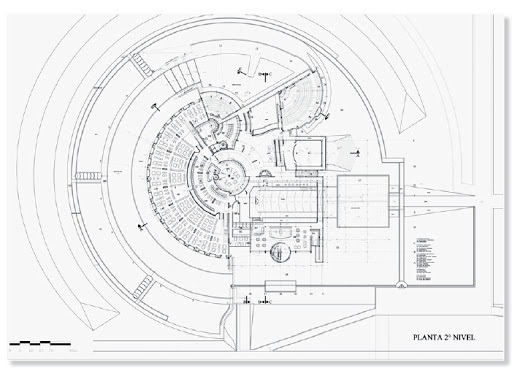 The project can be seen on http://www.herrerosarquitectos.com/Ind_Proyectos.html . The project will transform an industrial site on the edge between industrial and housing areas. 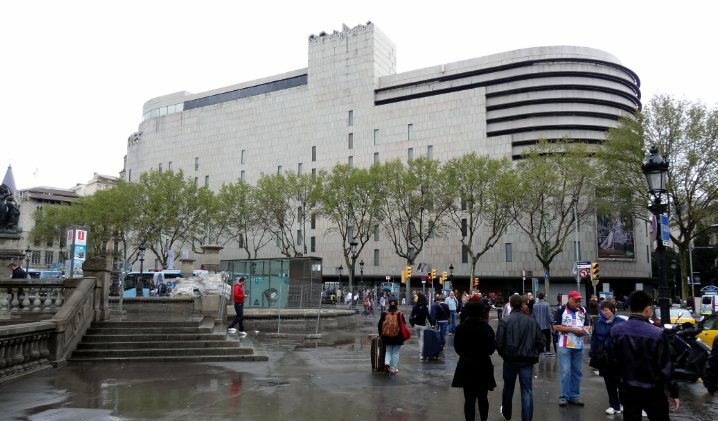 The Forum 2004 in Barcelona has a large concentration of towers, marking its landscape; yet the FAR in the tower area (under 3) is not as high as behind the towers, on the much lower Diagonal Mar mall, which gets to 5 as a mall is a much more compact building. Density can be explained in diverse ways. 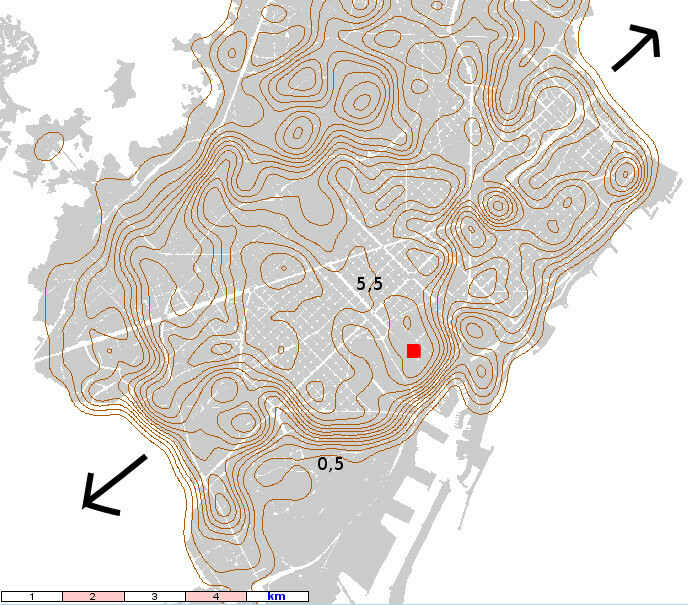 Here you can see, according to cadastral data, the gradient of the floor-area ratios by contour lines. The kernel calculation does not give show the precise density value, but a more graphical result for large areas. 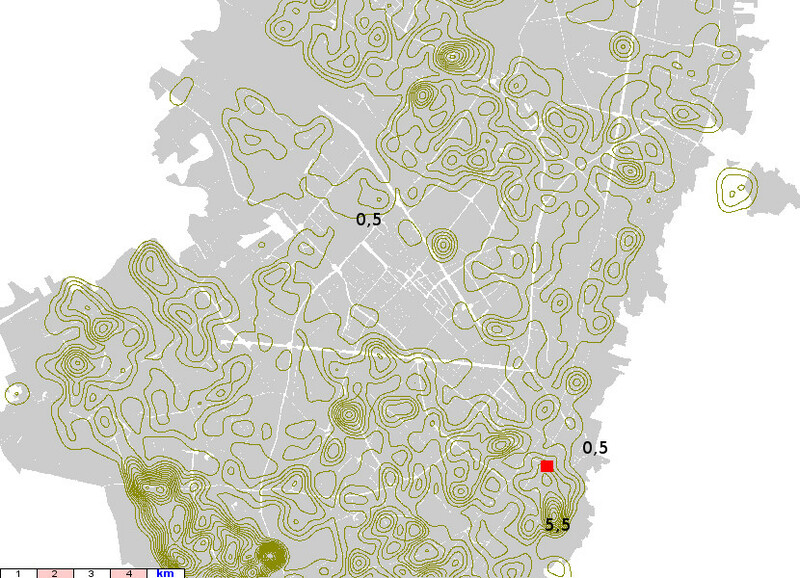 In Barcelona you can see that the most common density in the urban core is 5,5 (substantially higher than that devised by Cerdá in his 1860 extension plan). The city has an urban tissue whose density is quite homogeneous, surrounded as it is by mountains and the sea and as the core of a larger metropolitan area. Two cities on two continents and two different contexts. 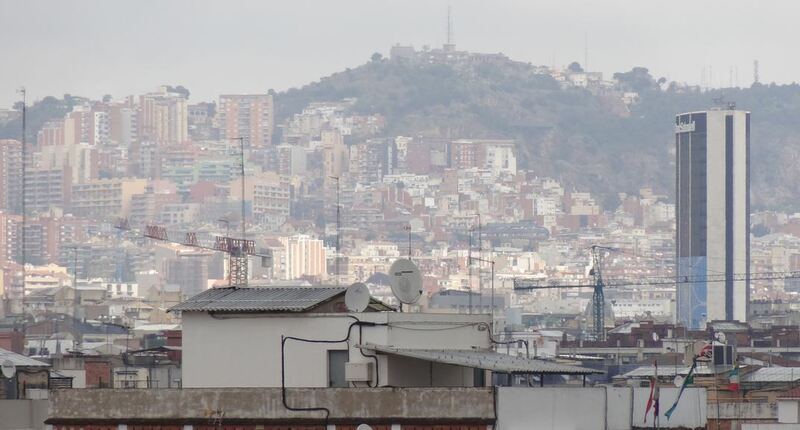 Barcelona on the Mediterranean sea, despite the crisis with a socioeconomic structure closet o the European average, and Bogotá surrounded by Andean mountains and with a social structure corresponding to a growing Latin American country. This week I propose an excursion around their urban tissues according to their density, that indicator that drives urbanists mad and that is looked for or rejected by people according to the conditions. 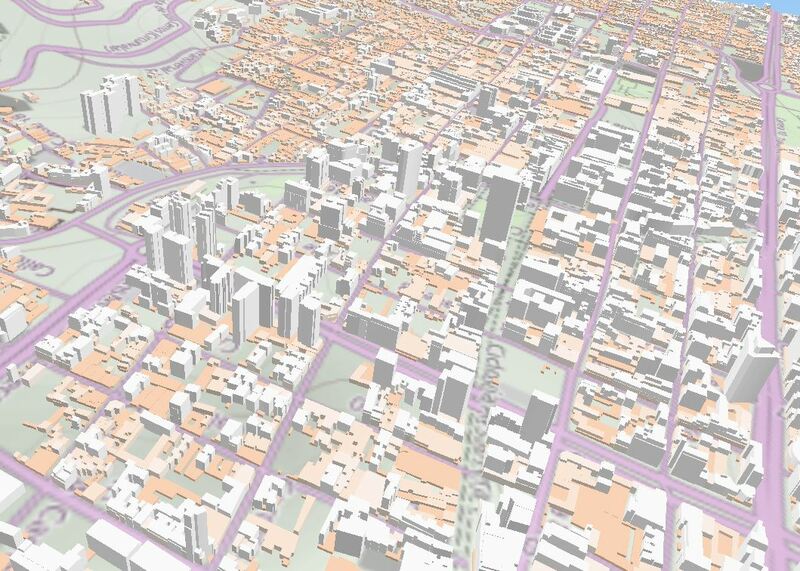 For this cadastral data have been used to draw density isolines allowing a parallel view. 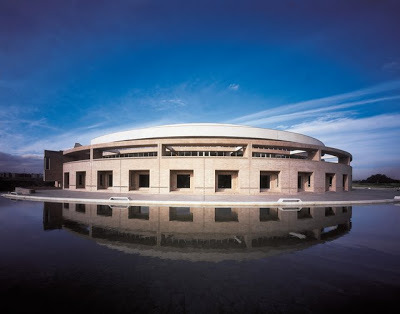 Rogelio Salmona (1927-2007) was a renowned Colombian architect that I had the chance to work with in a project for the Madrid municipal housing agency. As a young professional he worked with Le Corbusier in Paris, and later developped in his works an interesting approach which took into acount local traditions and innovative geometries, becoming one of the leading architects in his country. 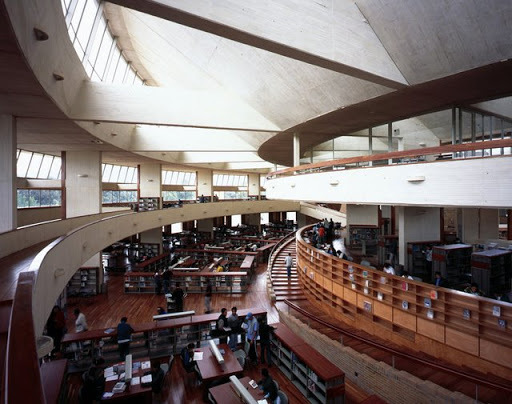 This library, built during the final 1990s, shows many elements of his architecture: a high quality masonry work, a good relation with public space, and a well designed structure.